Trivex is a new lens material originally developed for military applications,Trivex is stronger, clearer, and lighter than polycarbonate. Most importantly for sports applications. This has drawn over into everyday applications for people who will accept no sacrifice in durability, weight, impact resistance, or high quality vision. Polycarbonate lenses are the most impact resistant lenses available and are always the lens of choice for young people and active patients. They are usually the lightest and most comfortable lenses. Conventional hard resin lenses are half the weight of glass lenses and can be tinted to almost any color and density. Hard resin lenses are more easily scratched than glass but can have an optional scratch protection applied. More impact resistant than glass. Modern technology has created lenses that bend light differently so that stronger corrections are thinner than when made in conventional materials. Such lenses are called "high index" and stronger corrections are more attractive because they are slimmer. 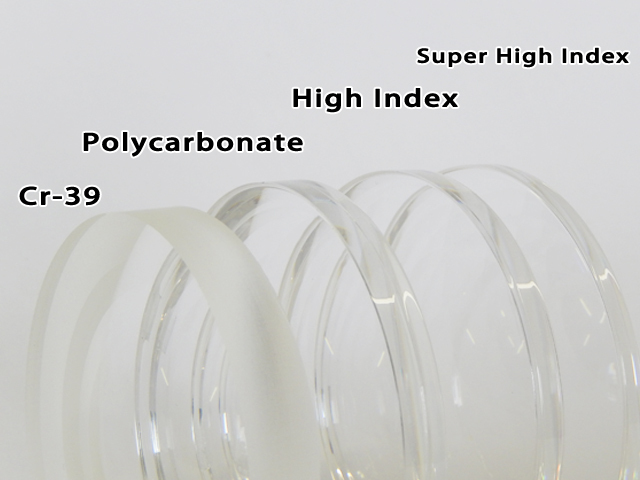 High index plastic uses less material so they are often lighter in weight. High index lenses absorb all harmful UV light and can be tinted to any shade or color. This lenses present the same benefits than the high index lenses, the only difference they are the lightest and thinnest lens in the market, for high prescription or the people who wants the most comfortable lenses. This lenses always come with an anti glare coating.